SXSW 2017 started yesterday. It was also my birthday and I decided to take the day off and have some photographic fun. Lunch at Hopdoddy’s with a fellow photographer and Olympus shooter, Warren, and then an hour or so at Precision Camera. Mid-afternoon, I headed downtown for the SXSW festivities. On 6th Street, National Geographic and Vox Media took over a bar and created their “Nat Geo Further Base Camp”. It’s an elaborate setup with a stage for live Podcasts, augmented reality demos and a free bar. I mixed in some photography for the perfect birthday fun. I was there for a couple of hours, shooting, talking and drinking. Later at night, I met the Olympus folks who are in town for a big Olympus Drink and Click event happening today. 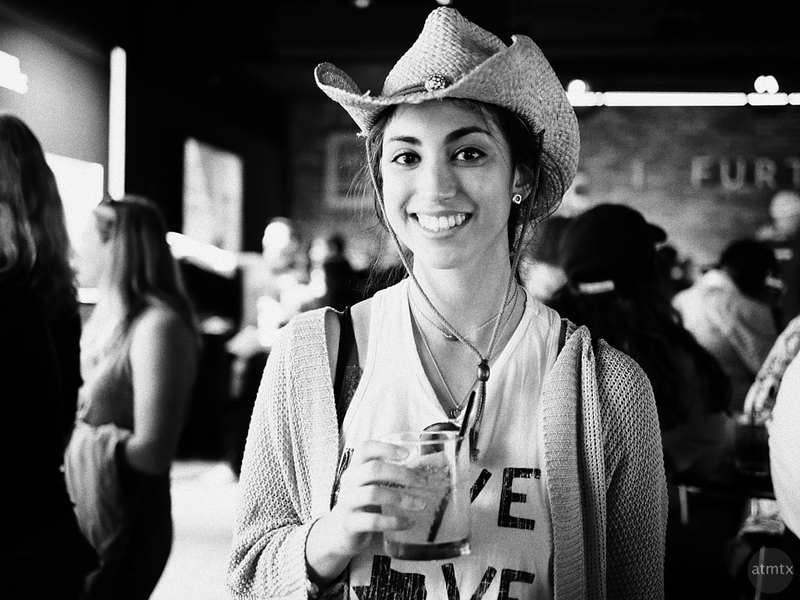 I’m starting a mini-series of casual SXSW Portraits, shot in black and white. First up, Isabella, who I met at the Base Camp, with a nice smile and texture hat. Shot with the Olympus PEN-F with the built-in “Mono Profile 2” and the Panasonic Leica 25mm f1.4 lens. I have zero desire to go anywhere near downtown until SXSW is gone. I’m always happy to enjoy your wonderful B&W portraiture though. You’ve got a real talent for this sort of thing. Well thank you, Mike. Visit my site for a small slice of SXSW. No parking hassles and not crowded at all. Hi Andy! This is me! Isn’t it funny that my birthday was the day after yours? Haha, well thank you for the picture and I hope you enjoy sxsw! Hi Isabella. LOL, that great. Happy belated birthday. Email me if you want a larger version of this photo.